Throughout the late winter and spring of 1917, Liberty Aflame played in vaudeville houses across the United States, where – judging from the many reviews – it was deemed a great success. While some reviewers felt it was unseemly to imitate the voices of the dying Lusitania passengers and crew on a vaudeville stage, they also recognized the “majestic dignity,” sincerity, and intensity with which Arthur endowed her character. Fig. 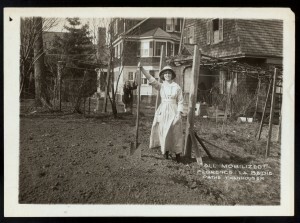 1 Theatre and Silent Screen Actress Florence La Badie Digging a Victory Garden, c. 1917. Tannhouser Studio Publicity Photograph. Courtesy New York Public Library, Billie Rose Theatre Division. Liberty Aflame was a particularly spectacular example of actresses’ promotion of wartime patriotism. Yet it was by no means an isolated event. A number of Canadian women (Canadian either by birth or by affiliation through residence) who had forged theatrical careers through transnational and transatlantic networks and circuits, showed support for Canada’s, Britain’s, and the United States’ participation in World War I. These actresses were involved in a range of “war work”: their images were used in military newspapers published overseas; they promoted wartime food production and fund-raising efforts; and they appeared in plays and films that commemorated the war. As well, Lena Ashwell organized musical and theatrical touring companies that travelled through wartime France. Why and how did these women become tied to wartime support? For some, their popularity on the stage was a significant factor. Toronto-born Margaret Bannerman, for example, whose family moved to England just as the war broke out, had started to forge a successful career in London’s West End. Appearing in revues and comedies, Bannerman became quite popular with servicemen enjoying a night out in the capital: so much so that her photograph was featured regularly in the pages of the Canadian Daily Record, a newspaper distributed to Canadian troops serving overseas. As a young and “colonial” performer struggling to carve out a career in the highly competitive world of English theatre, she would have welcomed the publicity and exposure that the Record gave her. Fig. 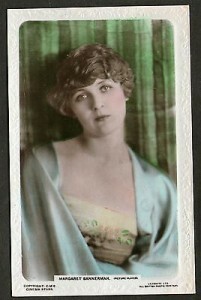 2 Margaret Bannerman Publicity Photograph, c. 1920s. Author’s Personal Collection. Other performers became involved through their pre-war political activism. Lena Ashwell had been involved in socially-engaged feminist theatre and had managed her own company since 1906; she undertook the organization of singers’, musicians’, and actors’ tours of France very deliberately. She was motivated not only by the desire to provide respite for the troops, but also by a wish to demonstrate the centrality and significance of art in general and, in particular, the importance of theatre and musical performance. Her account of the tours, Modern Troubadours, is filled with anecdotes of the warm welcome her companies received, and tales of badly wounded and, in some cases, dying soldiers whose suffering was alleviated by listening to music. Ashwell was keen to defend her profession and prove that it too was necessary to “war-work,” its spiritual solace being just as important as the work of war charities like the Red Cross or St. John Ambulance. Ashwell pondered the curious stance of the English public vis-à-vis theatre, specifically their unwarranted suspicions of actors as “a class of terribly wicked people who drink champagne all day long, and lie on sofas, receiving bouquets from rows of admirers who patiently wait in queues to present these tokens of rather unsavoury regard.” When war broke out, “two patriotic sections of the nation,” women and artists, were made to feel irrelevant and useless, she noted. “Women were advised to stay at home and knit . . . members of musical and theatrical professions were told they were a peace-time luxury, only useful if famous enough to attract philanthropists and millionaires to charity matinees.” Ashwell was optimistic, though, that because of their wartime experiences the barriers between performers and other sectors of British society had been breached. Fig. 3 Lena Ashwell in Barbara McLaren, Women of the War (London, New York and Toronto: Hodder and Stoughton, 1917). Ashwell’s own service did not go unrecognized. In 1917 she, along with eleven other women and Queen Mary, was awarded the newly created Order of the British Empire. Her award was celebrated by the British periodical Musical News, which told readers of the 6000 concerts she had given in France, Egypt, and Malta, as well as those held in camps in southern England and London hospitals. 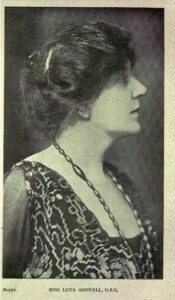 It noted too, that her work had employed 400 artists, “some of whom might have fared ill during the war but for her efforts.” Ashwell’s contributions, along with those of thirty other notable women, also appeared in the book Women of the War, which was introduced by former British Prime Minister Herbert Asquith. In contrast to Ashwell, Julia Arthur did not tour France during the war. Instead, her appearances in Liberty Aflame were targeted at home front support in the United States. As well as dressing as the Statue of Liberty, Arthur posed in military uniform for newspaper articles promoting the pageant. She also played a Red Cross nurse in J. Hartley Manners’ Out There, a fundraiser for the Red Cross that featured prominent stage actors and toured the Eastern Seaboard, the Mid-Atlantic, and the Midwest. 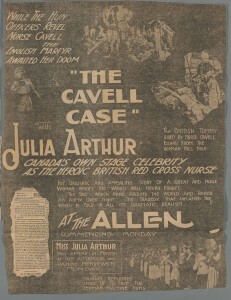 Moreover, Arthur appeared as Edith Cavell in the film Edith Cavell or, the Woman the Germans Shot. (Cavell, shot in Belgium by German occupying forces in 1915 on charges of spying, was the subject of a number of films that featured her patriotic self-sacrifice in the face of German barbarism). Fig. 4 Advertisement for Edith Cavell. Ottawa Journal, 22 March 1918. 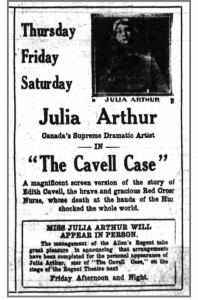 The Cavell film garnered Arthur additional publicity in the United States, and she travelled with it to Canada, where it was shown in Montreal, Toronto, Ottawa, London, and her hometown of Hamilton. Arthur made speeches at the film’s screenings, attended receptions given in her honour by the I.O.D.E and the Women’s Canadian Club, and was interviewed by the press. The film thus gave her the opportunity to publicly affirm and reiterate her affection for Canada and, too, to draw attention to the important home front work of Canadian women. She declared that there were many “fine heroines” among them who were like Jeanne d’Arc. Arthur’s contemporary, Ottawa-born Margaret Anglin, similarly lent her celebrity to the war effort in both the United States and Canada, singing, for example, at a service held in 1917 in Madison Square Gardens that was organized by the wives, mothers, and sisters of the 165th U.S. Infantry. She also appeared in the 1917 comedy Billeted, a light-hearted tale of a young English wife who, pretending to be a widow, opens her home to two officers and is caught in her deception when she discovers that one of the officers is her supposedly dead husband. Written by the British playwrights F. Tennyson Jesse and H. M. Harwood, Billeted ran in New York for a number of months in 1917-1918. Of course, these women were not the only female civilians to support the war. Other women were involved in home front voluntary activities, worked in agricultural production or factories, and in wartime nursing. In many ways these actresses’ wartime work was similar to that of their non-theatrical sisters. Yet it also was shaped by their celebrity status, their geographic and cultural mobility, and the theatre’s own history of supporting philanthropic and charitable enterprises. While not all these actresses publicly articulated their reasons for supporting the war, Ashwell and Arthur claimed that their work was aimed, ultimately, at securing peace. A defeat for Germany would represent a triumph for civilization: in their eyes, a civilization defined by its respect for the arts and artists. To be sure, the Allies were well aware that Germany had produced more than its share of “high culture,” the kind that Ashwell, for example, supported: Beethoven, Bach, Wagner, Goethe, and Schiller. Yet in wartime propaganda such archetypes were replaced by stereotypes of “the Hun,” an ape-like figure who attacked women and murdered children; such figures were prominent in publicity posters for Arthur’s Edith Cavell film. Fig. 5 Publicity Poster for Edith Cavell. Julia Arthur Papers, Courtesy of Houghton Library, Harvard University. Ashwell and Arthur’s experiences, then, remind us of the importance of culture to debates over the war’s significance and meaning. Not only was the war’s image created in a raft of cultural forms – prose, poetry, drama, film, music, sculpture, and painting – as well as in the language of official commendations and regimental histories, but the very notion of “culture” was a terrain the Allies claimed as proof of their moral superiority. Moreover, as a number of scholars have pointed out, in many ways World War I should be seen as an epitome of modern conflict. However, these actresses’ participation in wartime service remind us of the multiple and complicated dimensions of that modernity. Their representations drew on a repertoire of images of feminine self-sacrifice – ones that many of these women had portrayed onstage – which had been articulated and publicly disseminated over the course of the nineteenth century. In many ways such images were quite similar to the war’s commemoration in the 1920s and ‘30s, a public memory that, as Jonathan Vance has argued, was heavily influenced by late-Victorian and Edwardian tropes and genres. Depictions of these women as volunteer fundraisers, Red Cross nurses, and noble martyrs, though, co-existed with the actresses’ public visibility and managerial acumen, not to mention their deployment of forms of early twentieth-century technology, such as silent film. The experiences of Anglin, Arthur, Ashwell, and their contemporaries, then, suggest that our understanding of the war’s scope and complexity can be greatly enriched if we include both gender relations and the role of culture in its history. Dr. Cecilia Morgan is a social and cultural historian of Canada and the British Empire, and a professor at the Ontario Institute for Studies in Education (OISE) at the University of Toronto. This article draws upon her SSHRC-funded research examining English-Canadian actresses on transnational and imperial stages, 1860s-1940s.